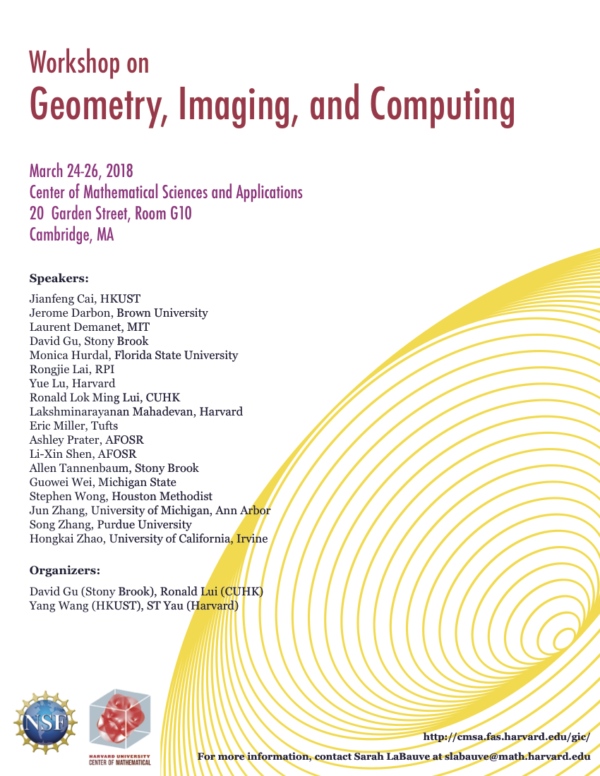 On March 24-26, The Center of Mathematical Sciences and Applications will be hosting a workshop on Geometry, Imaging, and Computing, based off the journal of the same name. The workshop will take place in CMSA building, G10. The organizing committee consists of Yang Wang (HKUST), Ronald Lui (CUHK), David Gu (Stony Brook), and Shing-Tung Yau (Harvard). This event is supported by the CMSA and the NSF. Abstract: The folding patterns of each brain are unique. There is much controversy in the biological community as to how the folding patterns of the brain develop and if the folding patterns can be used to identify and diagnose disease. In this presentation, I will discuss some of the mathematical and modeling approaches my research group is using to investigate these topics. Conformal mapping, topology, and Turing patterns are some of the methods we are using to characterize and model the folding patterns of the human brain in development, health, and disease. Abstract: Optimal mass transport is a rich area of research with applications to numerous disciplines including econometrics, fluid dynamics, automatic control, transportation, statistical physics, shape optimization, expert systems, image processing, and meteorology. In this talk, we describe a non-commutative counterpart of optimal transport where density matrices (i.e., Hermitian matrices that are positive-definite and have unit trace) replace probability distributions, and where “transport” corresponds to a flow on the space of such matrices that minimizes a corresponding action integral. We employ generalizations of the seminal approach of Benamou and Brenier. In particular, we utilize ideas from quantum mechanics in a Benamou–Brenier framework. Our version of non-commutative optimal mass transport allows us to define geodesics on the space of positive-densities. Applications are given to diffusion tensor MR data. This is joint work with Yongxin Chen and Tryphon Georgiou. Abstract: In this work, we show the intrinsic relations between optimal transportation and convex geometry, especially the variational approach to solve Alexandrov problem: constructing a convex polytope with prescribed face normals and volumes. This leads to a geometric interpretation to generative models, and leads to a novel framework for generative models. By using the optimal transportation view of GAN model, we show that the discriminator computes the Kantorovich potential, the generator calculates the transportation map. For a large class of transportation costs, the Kantorovich potential can give the optimal transportation map by a close-form formula. Therefore, it is sufficient to solely optimize the discriminator. This shows the adversarial competition can be avoided, and the computational architecture can be simplified. Preliminary experimental results show the geometric method outperforms WGAN for approximating probability measures with multiple clusters in low dimensional space. Abstract: Topology optimization is an optimization-driven methodology capable of generating an optimal design without depending on the designers’ intuition, experience, and inspiration. Topology optimization is playing a crucial and rapidly expanding role in design innovation in the 3D printing age. In this talk, the speaker will make a brief review of state of the art and introduce a level-set based topology optimization framework. After that, the speaker will report some of our recent efforts to advance the topology optimization methodology by combining the level set approach with the Conformal Geometry Theory. Level set approach has been considered as a powerful topology optimization (TO) tool for generating innovative designs, but the conventional level set framework is built in the Euclidean space (R2 and R3), which cannot satisfy the increasing demands of topology optimization on free-form surfaces. We propose a new method to address the problem of topology optimization for conformal structures on freeform surfaces which are mathematically termed as ‘manifolds.’ By using conformal parameterization, we extend the conventional level-set-based topology optimization framework from Euclidean space (R2 and R3) to surface with arbitrary topologies. In this method, a manifold (or free-form surface) is conformally mapped onto a 2D rectangular domain, where the level set functions are defined. With conformal mapping, the corresponding covariant derivatives on a manifold can be represented by the Euclidean differential operators multiplied by a scalar. Therefore, the TO problem on a free-form surface can be formulated as a 2D problem in the Euclidean space. To evolve the boundaries on a free-form surface, we propose a modified Hamilton-Jacobi Equation and solve it on a 2D plane following the Conformal Geometry Theory. In this way, we can fully utilize the conventional level-set-based computational framework. Compared with other established approaches which need to project the Euclidean differential operators to the manifold, the computational difficulty of our method is highly reduced while all the advantages of conventional level set methods are well preserved. The proposed computational framework provides a solution to increasing applications involving innovative structural designs on free-form surfaces for different fields of interests. Abstract: We characterize the intrinsic complexity of a set S in a metric space W by the least dimension N of a linear space V ⊂ W that can approximate S to an error. We show a scaling law for N for high frequency wave fields in term of the wavelength, for random fields in term of the correlation length, and for a set of random vectors in term of the dimension. Michigan State University Title: Is it time for a great chemistry between mathematics and biology? Abstract: In the history of science, mathematics has been a great partner of natural science, except for biology. The Hodgkin–Huxley model and Turing model indicate the union between mathematics and biology in the old days. However, in 1960s, biology became microscopic, i.e., molecular, while mathematics became abstract. They have been on two divergent paths since then. Modern biology, including molecular biology, structural biology, cell biology, evolutionary biology, biochemistry, biophysics, genetics, etc. are intimidating to mathematicians, while advanced mathematics, such as algebra, topology, geometry, graph theory, and analysis are equally frightening to biologists. Fortunately, biology assumed an omics dimension around the dawn of the millennium. The exponential growth of biological data has paved the way for biology to undertake a historic transition from being qualitative, phenomenological and descriptive to being quantitative, analytical and predictive. Such a transition offers both unprecedented opportunities and formidable challenges for mathematicians, just as quantum physics did a century ago. I will discuss how deep learning and mathematics, including algebraic topology, differential geometry, graph theory, and partial differential equation, lead my team to be a top performer in recent two D3R Grand Challenges, a worldwide competition series in computer-aided drug design and discovery. It is time for mathematics to embrace modern biology. Abstract: The ability to access signal features below the diffraction limit of an imaging system is a delicate nonlinear phenomenon called superresolution. The main theoretical question in this area is still mostly open: it concerns the precise balance of noise, bandwidth, and signal structure that enables super-resolved recovery. When structure is understood as sparsity on a grid, we show that there is a precise scaling law that extends Shannon-Nyquist theory, and which governs the asymptotic performance of a class of simple “subspace-based” algorithms. This law is universal in the minimax sense that no statistical estimator can outperform it significantly. By contrast, compressed sensing is in many cases suboptimal for the same task. Joint work with Nam Nguyen. Abstract: We are in the age of ubiquitous collection and processing of data of all kinds on unprecedented scales. Extracting meaningful information from the massive datasets being compiled by our society presents challenges and opportunities to signal and information processing research. For many modern statistical estimation problems, the new high-dimensional settings allow one to apply powerful asymptotic methods from probability theory and statistical physics to obtain precise characterizations that would otherwise be too complicated in moderate dimensions. I will present three vignettes of our work on exploiting such blessings of dimensionality to understand nonconvex statistical estimation via sharp asymptotic methods. In particular, I will show (1) the exact characterization of a widely-used spectral method for nonconvex signal recoveries; (2) how to use scaling and mean-field limits to analyze nonconvex optimization algorithms for high-dimensional inference and learning; and (3) how to precisely characterize the optimization landscape of a high-dimensional binary regression problem by exactly counting and mapping local minima. In all these problems, asymptotic methods not only clarify some of the fascinating phenomena that emerge with high-dimensional data, they also lead to optimal designs that significantly outperform commonly used heuristic choices. Abstract: We present a framework of non-convex methods for reconstructing a low rank matrix from its limited information, which arises from numerous practical applications in machine learning, imaging, signal processing, computer vision, etc. Our framework uses the geometry of the Riemannian manifold of all rank-r matrices. The methods will be applied to several concrete example problems such as matrix completion, phase retrieval, and robust principle component analysis. We will also provide theoretical guarantee of our methods for the convergence to the correct low-rank matrix. Abstract: We revisit classic framework of maximum entropy inference. It is well-known that the MaxEnt solution is the exponential family, which can be characterized by the dually-flat Hessian geometry. Here, we provide a generalization to the classic formulation by using a general form of entropy function, which leads to the deformed-exponential family as its solution. The resulting geometry may still be Hessian, but there is an extra degree of freedom in specifying the underlying geometry. Our framework can cover various generalized entropy functions, such as Tsallis entropy, Renyi entropy, phi-entropy, and cross-entropy functions widely used in machine learning and information sciences. It is an elementary application of concepts from Information Geometry. Abstract: The objective of this talk is to provide an overview of work over the past decade or so within my group at Tufts related to the quantification of tubular structures arising in a variety of medical imaging applications. We describe methods for detailed segmentation of dense neuronal networks from electron microscopy data as well as the identification of the bare connectivity structure of the murine cerebral microvasculature network given far-from-ideal fluorescence microcopy data sets. Beyond mapping, we have addressed problems of anomaly detection when considering the localization of intracranial aneurysms and developed graph-based methods as the basis for capturing differences in cerebral vascular networks across subjects. Though the problems and the data types are quite diverse, the mathematical and algorithmic methods share a number of commonalities. 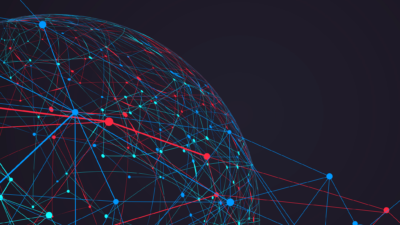 With the exception of the anomaly detection work, the neuronal segmentation, vascular network connectivity analysis, and network registration methods are all cast as binary integer programming problems. Though not in this class of solutions, the anomaly detection problem makes use of a geometric feature associated with curves, the writhe number, but applied to tubular surfaces and thus seems appropriate given the subject matter of this workshop. Abstract: We consider standard finite-dimensional variational models used in signal/image processing that consist in minimizing an energy involving a data fidelity term and a regularization term. We propose new remarks from a theoretical perspective which give a precise description on how the solutions of the optimization problem depend on the amount of smoothing effects and the data itself. 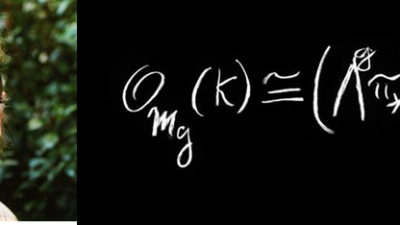 The dependence of the minimal values of the energy is shown to be ruled by Hamilton-Jacobi equations, while the minimizers u(x,t) for the observed images x and smoothing parameters t are given by u(x,t)=x – \nabla H(\nabla E(x,t)) where E(x,t)is the minimal value of the energy and H is a Hamiltonian related to the data fidelity term. Various vanishing smoothing parameter results are derived illustrating the role played by the prior in such limits. Finally, we briefly present an efficient numerical numerical method for solving certain Hamilton-Jacobi equations in high dimension and some applications in optimal control. RPI Title: Understanding Manifold-Structure Data via Geometric Modeling and Learning. Abstract: Analyzing and inferring the underlying global intrinsic structures of data from its local information are critical in many fields. In practice, coherent structures of data allow us to model data as low dimensional manifolds, represented as point clouds, in a possible high dimensional space. Different from image and signal processing which handle functions on flat domains with well-developed tools for processing and learning, manifold-structured data sets are far more challenging due to their complicated geometry. For example, the same geometric object can take very different coordinate representations due to the variety of embeddings, transformations or representations (imagine the same human body shape can have different poses as its nearly isometric embedding ambiguities). These ambiguities form an infinite dimensional isometric group and make higher-level tasks in manifold-structured data analysis and understanding even more challenging. To overcome these ambiguities, I will first discuss modeling based methods. This approach uses geometric PDEs to adapt the intrinsic manifolds structure of data and extracts various invariant descriptors to characterize and understand data through solutions of differential equations on manifolds. Inspired by recent developments of deep learning, I will also discuss our recent work of a new way of defining convolution on manifolds and demonstrate its potential to conduct geometric deep learning on manifolds. This geometric way of defining convolution provides a natural combination of modeling and learning on manifolds. It enables further applications of comparing, classifying and understanding manifold-structured data by combing with recent advances in machine learning theory. If time permits, I will also discuss extensions of these methods to understand manifold-structured data represented as incomplete inter-point distance information by combining with low-rank matrix completion theory. Abstract: Advances in optical imaging and machine/computer vision have provided integrated smart sensing systems for the manufacturing industry; and advanced 3D imaging could have profound impact on numerous fields, with broader applications including manufacturing, biomedical engineering, homeland security, and entertainment. Our research addresses the challenges in high-speed 3D imaging and optical information processing. For example, we have developed a system that simultaneously captures, processes and displays 3D geometries at 30 Hz with over 300,000 measurement points per frame, which was unprecedented at that time (a decade ago). Our current research focuses on achieving speed breakthroughs by developing the binary defocusing techniques and the mechanical projection method. The binary defocusing methods coincide with the inherent operation mechanism of the digital-light-processing (DLP) technology, permitting tens of kHz 3D imaging speed at camera pixel spatial resolution; and utilizing the mechanical projection system further broaden the light spectrum usage. In this talk, I will present two platform technologies that we have developed as well as some of the applications that we have been exploring including cardiac mechanics, forensic science, as well as bio-inspired robotics.